A couple of times, during the past two decades, I have heard from die-hard, wise-guy, Swan aficionados, who claim that Scorpio (and the Nautor 43 in general) is not a Swan. Now, since Scorpio is for sale, I decided to bring up this question – just in case. So, what is the answer? Is Scorpio a Swan, or isn’t she? “Swan” is the generic name of all yachts built by Nautor’s Swan. 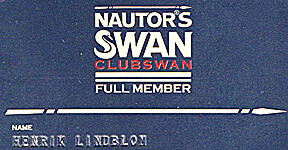 And Nautor’s Swan’ is the trade name used by the company registered as Oy Nautor Ab, but commonly called simply Swan. The production line during the years since Nautor’s Swan was founded in 1966 consists of a) SwanLine Swans, b) one-off Swans, c) motorsailer Swans and d) motorboat Swans. The names of the models of the SwanLine are made up by the word Swan plus a number, while the model-names of the rest of the Swans have the word Nautor plus a number. The Sparkman & Stephens designed 43 footer (1967-72) was therefore a 'Swan 43 Swan', and so was the Ron Holland designed (1985-90) model. Scorpio, on the other hand, is a 'Nautor 43 Swan'. To simplify things, the Swan 43 is usually called simply a Swan 43 and the Nautor 43 is called a Nautor 43 Swan. The expression 'a Nautor 43 Swan' is completely in accordance with the vocabulary used by the sailing community in general and in particular by Nautor’s Swan (as the company calls itself), or just Swan (the usually accepted name in the market). 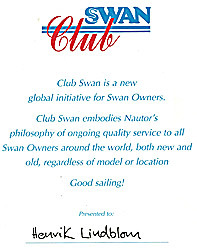 ClubSwan was founded by Nautor’s Swan, and according to its rules, all owners of 'Swan yachts', regardless of model are accepted as Full Members. As owner of Scorpio I was consequently presented a Club Certificate and a Full Membership card. The owner’s manual which was delivered with Scorpio is titled “Nautor’s Swan Owner’s Manual” and any correspondence from the yard addresses me as “Dear Swan Owner”. And I can assure you that certainly every buyer of a Nautor 43 has believed that he purchased a Swan. Throughout the boat building industry and all sailing communities the word Swan is regarded as an attribute of prestige and a guarantee of quality of design, materials and workmanship. The Nautor 43 yachts were designed and built by the same teams as the SwanLine models using the same materials, methods and outfitted them with the same hardware and other equipment. If the company that built the yachts chooses to regard them all as “Swans” I don’t see why anybody would deny them the privilege to do so. Here are some additional comments regarding the Nautor model-name. Does this look like a motorsailer? Don’t take the epithet motorsailer too seriously. If you look at the Sparkman & Stephens Blogspot you will see that, for the Nautor 43, they use the word “motorsailer” in brackets. This is really a full-fledged flush deck sailing yacht, albeit with water tanks as well as fuel tanks 3-4 times larger than those of other Swans, or any other comparable sailing boats for that matter. The use of the word Nautor for this model has one particular reason. 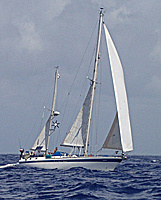 In the early 1970s the Swan developers sensed that there could be a demand for a different kind of ocean going ultra long distance cruiser, which led to the development of this 43 feet centre cockpit ketch, designed on the same drawing boards as all other Swans up till that date. The marketing department, however, was worried that the radical difference between the long distance cruiser model and the rest of the 'cruiser-racer' Swans might spread the wrong signals through the sailing community, an indication of larger changes to the production line. 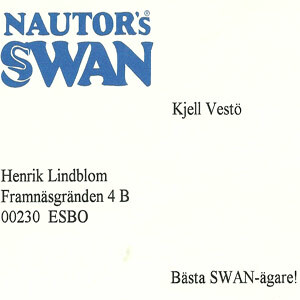 Olle Emmes, long time Managing Director of Nautor’s Swan, later confessed to me that, with hind sight, he thought it was a mistake. It is a goddamn sailing boat, he said, we should have chosen a more consequent label. Like, for instance, Swan 43CC (for centre cockpit), or Swan 43MS (motor sailer), or why not Swan N43. The other possible reason for using the name Nautor could have been the desire to build an other brand side by side with the prestigeous Swan name. The Nautor 43 and the Nautor 50-models, however, became too expensive to build for the market-niche they were planned. The price of the Nautor 50, for example, was almost double the price of the luxurious considered (and only about half metre shorter) Swan 48 built in the same year. The Nautor 43 was a favourite with Rod Stephens while his more racing oriented brother Olin preferred the Swan Line models. Some of the one-off, custom yachts that the Swan yard has built have also been labelled Nautors. One early example is the 102ft Ron Holland designed Garuda (1986). 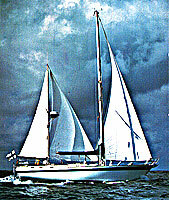 More recent examples are the 76ft Silandra V (2006) and 78ft Valkyrie (2007). Maybe the Nautor-name for Silandra V and Valyrie has to do with the designers; these yachts were designed by Luca Brenta and Bill Tripp, respectively, while all other Swans for many years now have been designed by Germán Freres. Maybe Nautor has given Freres exclusive rights to design Swan-labelled yachts? Whatever the reason for these yachts being officially labelled Nautor and not Swan, I don't think even the most conservative Swan enthusiast would deny the fact that these yachts are indeed Swans. And, another fact, if you research the web you will find these yachts are commonly called Swan 102, Swan 76 and Swan 78 respectively. 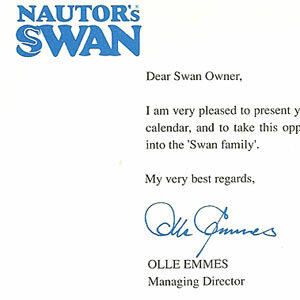 In the 1996 publication Thirty Years of Nautor's Swan, Managing Director Olle Emmes tried to explain the reason for the company's long-term success as a standard setter in a market place where names come and go with regularity. Everything comes down, he says, to one single phrase: 'Essence of Swan'. He enumerates the expected elements one associates with a great marque - an unwavering commitment to performance and almost fanatical attention to quality. There is more: Seaworthiness and durability. Style. Superb interior design and finish. "This is not just an engineering thing" he explains. "This is something that is ingrained in the spirit and the culture of the company. We are more than a yacht builder ... The market indicates a need and we recognize it - but at the same time we won't deliver a yacht that won't be seen in hundreds of subtle ways as a Swan". As sometimes happens, I probably got a bit carried away, and might be accused of over-kill defending the use of the Swan name for all of Nautor's yachts. And for all practical purposes it is indifferent anyway whether the yacht is called a Swan or a Nautor. For the records: The opinions expressed above are mine alone and not necessarily endorsed by Nautor's Swan. I have a few additional comments regarding the sometimes confusing question, What is a Swan? 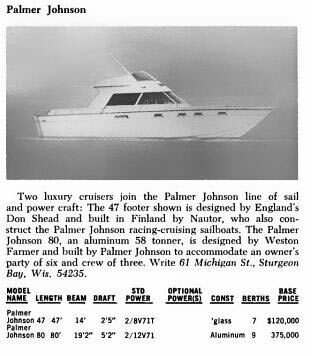 During the early years (until the mid-70s I think), Nautor worked with Palmer Johnson to help market and sell their yachts in the USA. Probably all of the fibre glass S&S designed 'Palmer Johnson'-yachts were built by Nautor but sold as Palmer Johnsons. For example the Swan 37 (design 2035) became a Palmer Johnson PJ37 and the Swan 40 (2025) became the PJ40. The same appears to apply to the Swan motorboats, where the Don Shead designed Nautor 47 was marketed by Palmer Johnson as the Palmer Johnson 47. The Palmer Johnson yard built very few fibre glass yachts because they had decided to focus on aluminium. Below is a rare photo of the seldom spotted Nautor 47/Palmer Johnson 47. The text of the advertisment includes the following: ... built in Finland by Nautor, who also construct the Palmer Johnson racing-cruising sailboats. The obvious question to our conservative Swan aficionados is: are these Palmer Johnsons Swans or what? At least the builder Nautor's Swan includes them in the number of Swans built. The ad above is from Motorboating & Sailing, October 1970.